Steam, Fire, Ice and TNT! The Hudson Fire Department, Ice Harvesting on the Ottawa River, Local CPR line celebrates its 100th Anniversary and the Rigaud Munitions Factory Explosion of 1917 are covered in this new book. Submitted by webmaster on Sat, 2006-04-15 19:49. Thomas Bassett Macaulay was an insurance executive (Sun Life Assurance) and gentleman farmer. 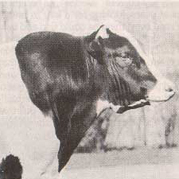 Descendants of his herd of Holsteins can be found throughout the world. Submitted by webmaster on Sat, 2006-04-15 13:47. Fort Senneville was built in 1702-03 to protect the nearby fur trading post. It was destroyed in 1776 by American troops, but the ruins were maintained. In 2003 it was classified as an historical site. The story of two of Hudson's most famous citizens - T.B. Macaulay and his Holstein bull Joanna Ragapple Pabst ("Old Joe") - can now be found on the Virtual Museum of Canada's Community Memories site. 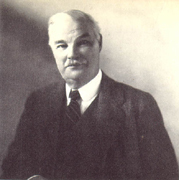 Macaulay (1860-1942), president of the Sun Life Assurance Company for many years, also owned Mount Victoria Farms in Hudson Heights. Mount Victoria Farms contributed to the improvement of crops such as corn and soybeans, but is best known for its herd of Holstein cows that produced impressive quantities of butterfat-rich milk. Old Joe's descendents can be found in herds around the world. Hudson Historical Society Archivist W. Lambert "Scot" Gardiner, ably assisted by computer consultants Wendy Cohen and Trish Santa, devoted literally hundreds of hours putting T.B. Macaulay and Mount Victoria Farms online. Their work can be found at www.virtualmuseum.ca. While in the Virtual Museum be sure to check out another Hudson project, That was Phoebe: A Community Remembers its Past, the story of Phoebe Hyde and Greenwood. These are but two of the 77 fascinating stories contributed thus far by heritage organizations around the country. Canada's Virtual Museum is well worth a visit!